So, school starts on Monday and I'm ready to hit the ground running for the 2nd year in the principal's office! As a former classroom teacher (who is always a teacher at heart! ), I would ask my students to ask three friends before coming to me for assistance. Now that I am wiser... fine, older too... I see that I missed a huge opportunity by asking them to check with 3 before me. I wasn't helping my students become THINKERS... I was enabling them to rely on others for information that they should be able to gather on their own. This is definitely one of those things that I would do differently now if I were back in the classroom! I had this very conversation with a colleague today and this sign was born! I have printed (on bright blue paper) and laminated a copy for each member of my staff and have asked them to display this in their rooms as we encourage our students to display tenacity to solve problems! 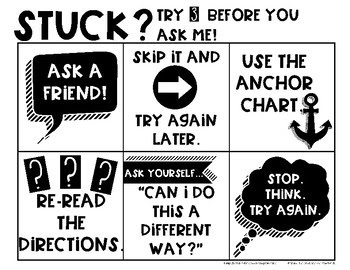 This sign gives students options and teaches strategies for continuing on when stuck and encourages independence. 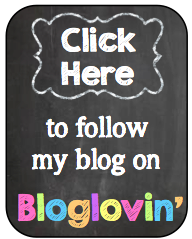 Enjoy a free copy on TpT and have a great school year! 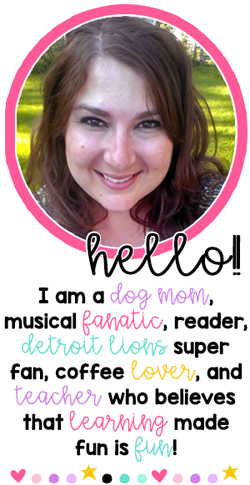 Oh... and don't miss my newest product on TpT either! 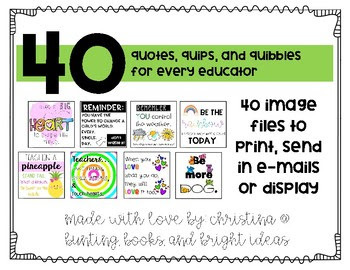 This set of 40 png files are the perfect pick-me-ups, messages of inspiration, and reminders to educators just how important our job is. I print these every few weeks and put them in my teachers' mailboxes. 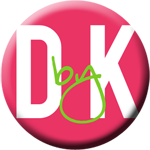 You can also attach the image files in an e-mail or insert into a document- which I sometimes do too for staff meetings! Happy 2017-18 school year... may it be the best one yet!